Images on this page thanks to Gijess, or found on eBay , with thanks to various sellers including jiggers1209 , ray0463 , qualityconst88 , juiceworm, jblb2cb and villagetreasures2012 ! "Responds to you! Light activated. No touch needed. 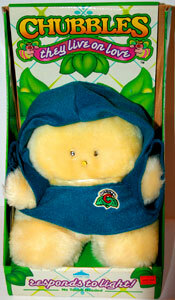 Chubbles come to you directly from Chase-A-Tail Dale, near Firefly Forest. 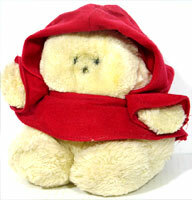 They are caring little creatures whose mission is to bring love and good cheer to beings of all ages. 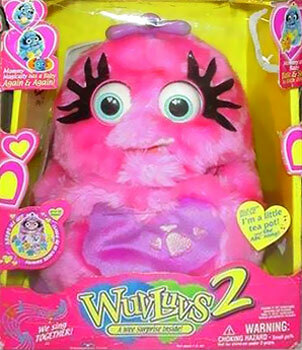 Chubbles live on love and need no special care. You don't even have to feed them. Changes in the light around them make the Chubbles respond. 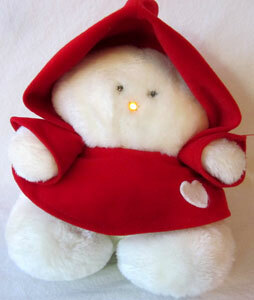 The firefly in their nose lights up and they chiggle This is an amusing sound that is something like a giggle. 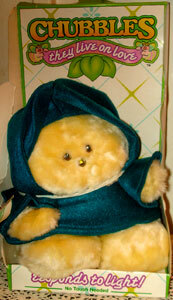 So, tell your troubles to a Chubble. 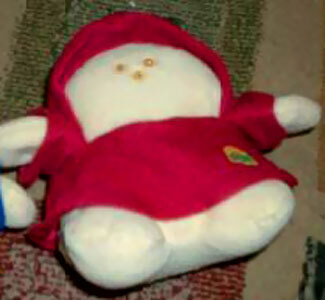 They have no mouths so they can never, never tell. 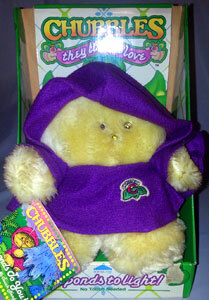 If you keep your Chubble near, you'll always have love and lots of Chubble cheer." 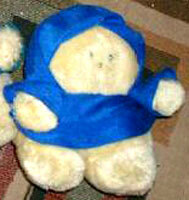 Chubbles came with one of four different coloured cloaks - teal, blue, purple or red. 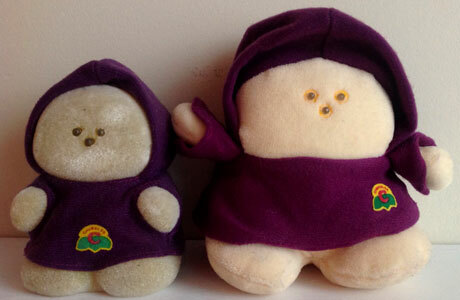 The original Chubbles from 1984 were released with no embroidered label on their cloaks but as they gained popularity the label was added (1985). They measured about 8 inches high. 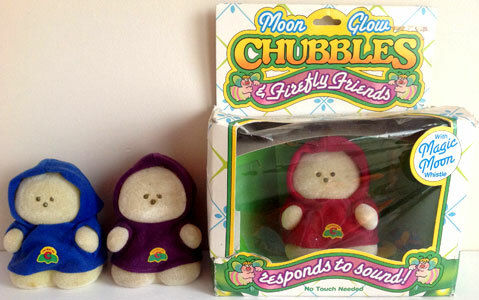 There was also a smaller version of Chubbles called Moonglow Chubbles (see lower down page). "Welcome to Hide 'n Peek Hollow, Chubbles Firefly Forest home, where Chubbles and his giggle pal Chiggles play chase-a tail with their Glow 'n the Dark Firefly Friends by the light of Moonglow pond. It's a special loving place... and it's just waiting for you." 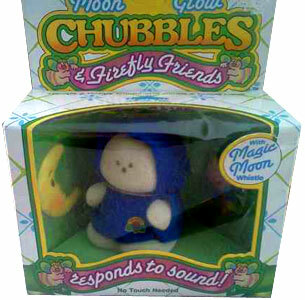 "Deep within Firefly Forest is a very special place called Moonglow Pond, where Moonglow Chubbles and their Firefly Friends play by the loving glow of the full moon. Their loving giggles will warm your heart. 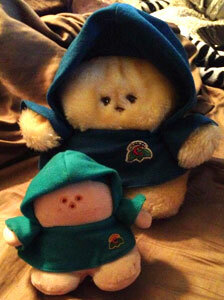 Their magical glow with protect you from the darkness." 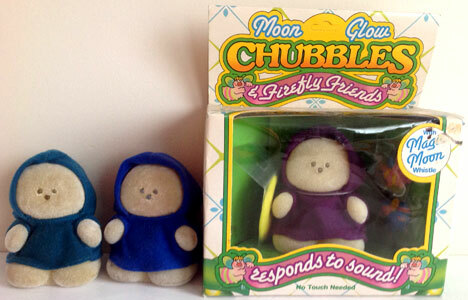 Moon Glow Chubbles came in two sizes, measuring around 4 inches and 6 inches. 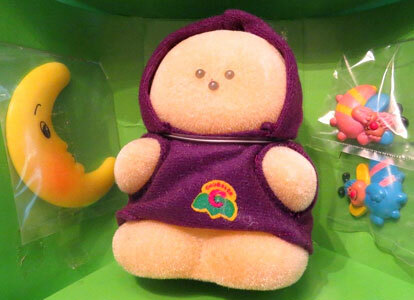 The smaller version were made of a flocked plastic. They came with a moon shaped whistle which they would respond to by giggling and lighting up their noses and two firefly brooches. 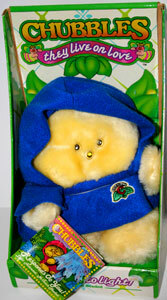 They came in four different coloured cloaks just like the original Chubbles (blue, teal, read and purple). 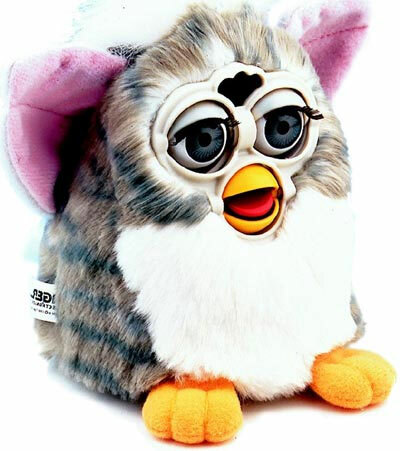 Some had the logo and some didn't (also just like the original Chubbles). 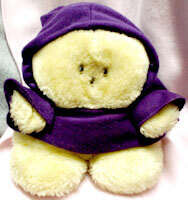 The larger version were about 6 inches high and made of a soft glow-in-the-dark fabric. I'm not sure how they were sold as I've not yet come across any packaged. 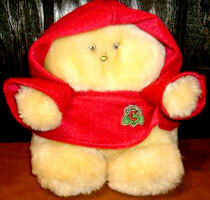 I've found one other Chubbles, most likely sold for Valentine's Day.